Posted on Tuesday, June 7th, 2011 at 8:25 am by Pieter van der Westhuizen. Add-in Express enables you as a developer to quickly and easily create, not just MS Office add-ins but also Excel XLL add-ins, Excel Real-time data (RTD) servers and smart tags. In this post I’ll demonstrate how you could include all this functionality in one Visual Studio project. 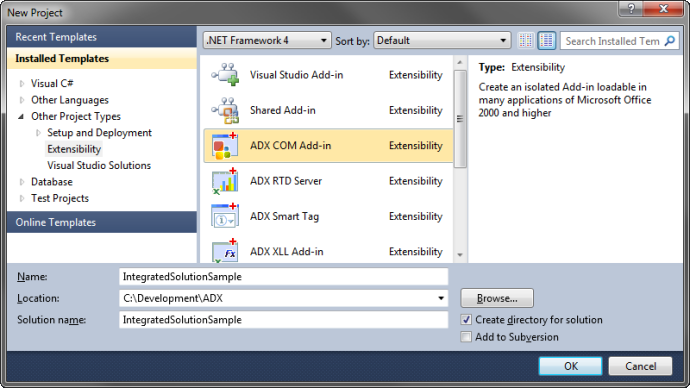 Start by creating a new ADX COM Add-in project in Visual Studio. Finish the wizard by selecting Visual C# as the programming language, Microsoft Office 2007 as the minimum supported Office version and Microsoft Excel, Word and Outlook as the supported applications. We now have our shared functionality, let’s add a Smart Tag to the add-in. 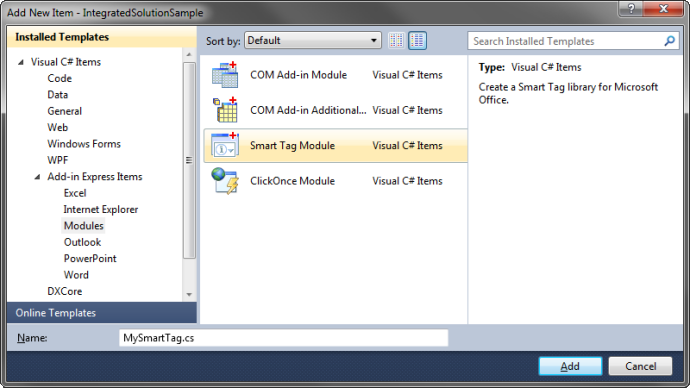 Right-click on the project name in the Solution Explorer and select Add > New Item from the context menu. In the Add New Item dialog window select Smart Tag Module. Click on the ellipses(…) button next to the Actions property and add two actions. Next, we’ll include our own custom Excel function that calculates the distance between any two latitude/longitude points. To do this you’ll need to add a new XLL Add-in Module to your project by right-clicking on the project name and selecting Add > New Item from the context menu. 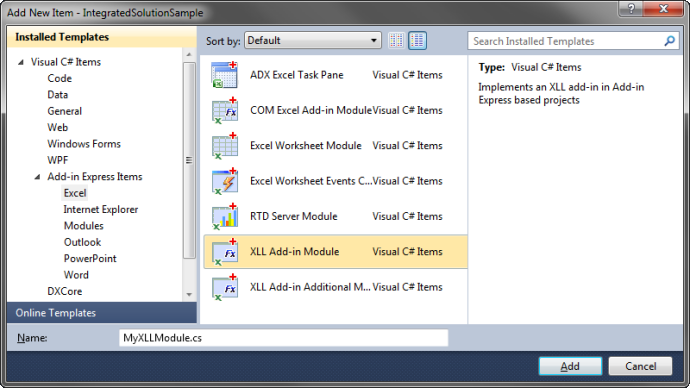 Select XLL Add-in Module from the Add New Item window and click Add. Once the code for the function was created, switch back to the XLLModule’s designer surface and select Add Excel Function Category from the right-click context menu. Change the CategoryName property to GPS Functions and click the ellipses(…) button next to the FunctionDescriptors property. Add a new Function to the collection and select the function name from the dropdown list and change the Description property to “Calculates the distance between two longitude and latitude values“. 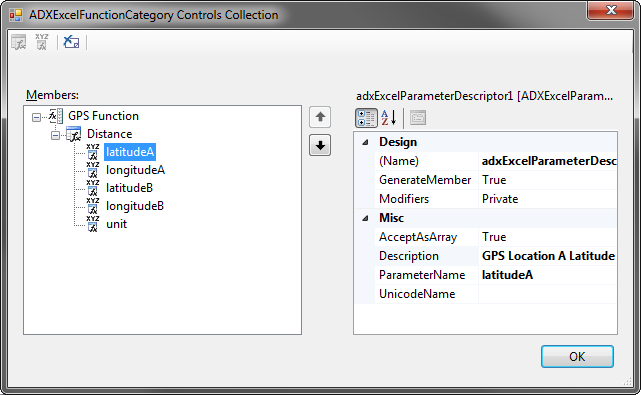 With the function selected click the Add Parameter button to add parameter descriptions. Finally, we’ll add a Real-Time Data (RTD) server to our project. Do this by adding a new RTD Server Module to your project. 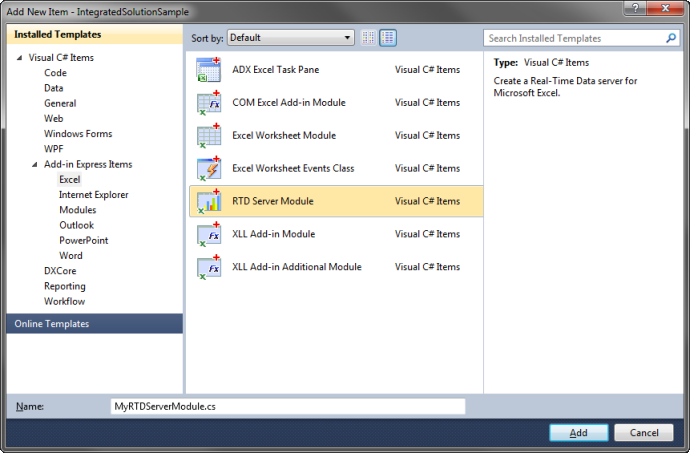 Open the RTDM Module designer and select Add RTD Topic from the context-menu. 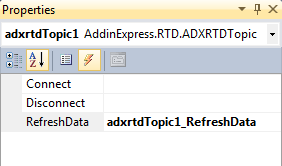 Set the new topic’s String01 property to *, this is required in order to pass a parameter to the RTD server and the String02 property to RandomValue. Add an event handler for the RefreshData event by double-clicking on the RefreshData event in the list of events in the property window. Guys did you ever discover a method to replace smarttags action menus for 2010? it was pretty cool that smarttags allowed to inject arbitrary visible contextual menus into word documents, too bad that they’re deprecated. 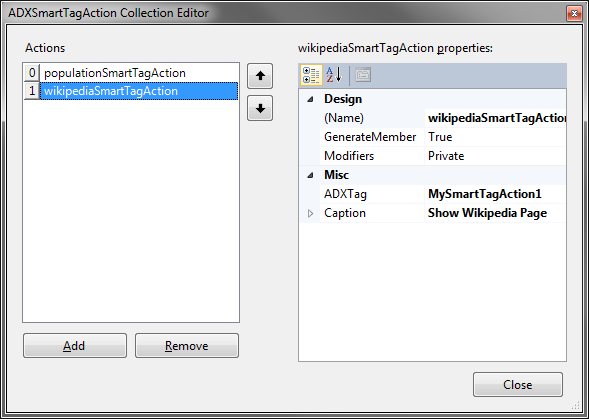 Smart tags are deprecated in Excel 2010 and Word 2010. However, they still in use: you just need to do a right click on the word. Please read more about this in the Smart Tags article in MSDN. Also you may use the ADXRibbonContextMenu component for showing your actions dynamically (see the Dynamic property of the ADXRibbonMenu control).